Bagherzadeh and Jose Saavedra Torres. CARBONDALE, Ill. – People sometimes buy expensive items just to impress others, a phenomenon known as conspicuous consumption. But two Southern Illinois University Carbondale marketing doctoral students have discovered that there’s more involved in those purchasing decisions than meets the eye. 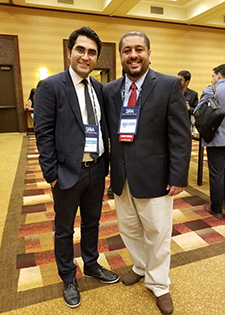 The research paper covering their findings, titled “Need for more: Conspicuous consumption, social settings and materialism,” earned Ramin Bagherzadeh, and Jose Saavedra Torres national recognition as The Pearson Education Michael Solomon Best Paper in Consumer Behavior Track. Through preliminary research, Bagherzadeh, and Torres studied perceptions people have of themselves and their status in relation to their purchasing habits. They learned that people who feel somewhat powerless in their lives are more likely to believe that buying expensive items increases their power and status, leading them to more conspicuous consumption. “We also proposed that social context would moderate this relationship,” Saavedra, who is from Venezuela, said. Their early research indicates that consumers who feel less powerful are more prone to conspicuous consumption in a public setting rather than a private one. The expensive purchases lead them to feel more powerful but they also feed on the perceptions of others, so they are more likely to buy pricey goods if others are watching them do so. Conversely, conspicuous consumption drives are lower for consumers who already perceive themselves as higher on the power grid, and their drives seem to be unaffected by the social context or who is watching. The College of Business students propose that the degree of materialism people embrace affects their buying habits, particularly in some groups. “People who perceive themselves as having more power are likely to have a higher preference for conspicuous consumption if they are more materialistic, whereas consumers who feel less powerful seem to have a higher preference for conspicuous consumption, regardless of their materialistic condition,” Bagherzadeh, who is from Iran, said. The research paper began as a class project. Bagherzadeh initiated the work during the fall 2016 Consumer Behavior Seminar taught by Jaehoon Lee, assistant professor of marketing. Saavedra joined him for further study and expansion of the first paper. The result is the prize-winning paper “Need for more: Conspicuous consumption, social settings and materialism.” Saavedra said their work is still in the early stages and based largely on small-scale research which they intend to expand upon by collecting more data. They will then submit their findings to prestigious journals for publication, Bagherzadeh said. Lee is proud of the work his students put forth on their research. The research paper by Saavedra and Bagherzadeh won national recognition as The Pearson Education Michael Solomon Best Paper in Consumer Behavior Track. The annual prize goes to the best peer-reviewed competitive consumer behavior research paper. The two received their award at the recent 2017 Society for Marketing Advances (SMA) annual conference in Louisville, Ky.
SMA members include marketing educators and professionals from around the world. A summary of the paper will be published within SMA’s conference proceedings this spring and the students hope it will be published in its entirety in a journal in the future. Bagherzadeh and Saavedra plan to continue their research and their doctoral studies at SIU. Saavedra’s research interests include marketing strategy, branding, sales and business to business marketing. He anticipates completing his degree in May 2019. Bagherzadeh’s research focuses largely on marketing strategy, online consumer behavior and social media and he plans to graduate in 2020. They will both seek positions in academia, joining the faculty at a research-oriented university somewhere, they said.